1. Preheat the oven to 180ºC, gas mark 4. Grease and base line a 20cm round tin with baking parchment. 2. Mix the flours together. In a separate bowl, whisk the Stork with the sugar until pale and fluffy. Beat in the vanilla extract and then the eggs one at a time. Fold in the flours and add the milk until you have a good dropping consistency. Spoon into the tin and bake for 45-50 minutes until cooked throughout. Allow to cool. 3. To make the cake pops, crumble the cake with your fingers to make a breadcrumb consistency. Place 50g white chocolate and the raspberry jam in a bowl and place over a pan of simmering water until dissolved then mix into the cake crumbs. Divide the mixture into 12 and shape into balls. 4. Dip one end of each stick or skewer in the melted plain chocolate and press into each cake ball. Chill in the fridge for 2 hours (or 20 minutes in a freezer). 5. To make witches’ hats, cut the tip off each ice cream cone about 5-6cm long and brush with the apricot jam. Divide the black icing into six and roll each out into a rectangle big enough to cover the cone. Dip the wide end of the cone into the melted chocolate and place on a Catherine wheel and allow to set. 6. Dip six cake pops in the melted plain chocolate, gently shaking off any excess chocolate and stand the sticks upright in a heavy-bottomed narrow glass, ensuring they don’t touch each other. Press a witch’s hat on top and chill in the fridge. 7. 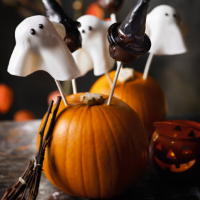 To make the ghosts, dip the remaining cake pops into the white chocolate to evenly coat, gently shaking off any excess. Press each stick again into polystyrene to allow it to stand upright. 8. Roll out the white icing and cut 6 x 11cm circles. Drape each circle over the cake pops and pinch the ends to look like ghosts. Use a tiny amount of the black icing from the witches’ hats to make little eyes. Place in the fridge to chill until you’re ready to serve.